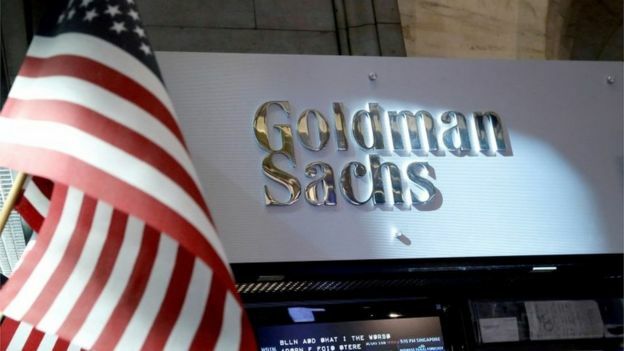 The new chief executive of Goldman Sachs says that a “difficult” Brexit will negatively affect its investment plans in the UK. David Solomon told the BBC that while there has been a frozen headcount in the UK, the bank has been adding staff in the EU over the last two years. The outcome of Brexit would affect decisions about Goldman’s people and resources, he said. The Wall Street giant employs 6,000 people in the UK. Speaking at the World Economic Forum, in Davos, Mr Solomon said: “If this [Brexit] is resolved in a difficult way, or in a hard way, I do think it’ll have an impact on where we invest in where we put people. Of Goldman’s UK staff, a few – in the dozens – have been asked to move to locations elsewhere in Europe. However, the bank has added hundreds of staff to offices in Frankfurt, Paris, Stockholm, Milan and Madrid. While Brexit is a concern for the bank, it is not top of its list of worries. That spot goes to the fraught relationship between the world’s two largest economies – the US and China. While some see the US as the aggressor in the trade war with China, Mr Solomon has sympathy with Donald Trump’s ambitions to reset the rules. “I think the administration has it right. I think there have been imbalances in the way the US and China have dealt with each other, particularly the openness of China’s had with respect to US business. “We want to see a level playing field and we want to see our technology and our investment over a long period of time protected,” Mr Solomon told the BBC. He said he hoped that the US and China could resolve their differences by March – the date that the US is planning to introduce a new wave of higher tariffs on imports from China. Mr Solomon speaks for many at this year’s World Economic Forum. The chatter in the congress hall, the receptions and the restaurants, is focused on the US and China, and whether the trade tensions between the economic superpowers could tip the world into a serious slowdown. The Goldman boss said he didn’t think a global recession was imminent, but he said there was a 15% chance of a downturn in the US this year, and a 50% chance next year. Neither Mr Solomon, nor anyone else in Davos, is prepared to make such a precise estimate of the chances of the no deal Brexit that most businesses here fear. But it is certainly fair to say that he and most business leaders in Davos think it’s becoming less likely.